After finishing the Quarry Trail we hopped on the train to Machu Picchu town with the members who had also stayed in Cuzco. The train journey was great, the trains have panoramic roofs so you get amazing views of the valley. The staff were also a bit hilarious! I treated myself to very long shower, although my bathroom was a bit strange. It was a bit like a 1980s bachelor pad with a black toilet and then zebra and heart print shower curtains! Seriously who buys a black toilet!! I also had a massage to try and help with my right knee but it was a bit cold to be honest. The following morning we got up super early to head up the mountain before the hikers got in, so we could meet them coming down from the sun gate. We were very lucky as it was very quiet and the views were great as it was pretty clear. Only four of us had headed up early and I was extremely privileged to witness a beautiful proposal! How exciting and what a spot to do it! We met the Inca Trail hikers coming down the steps and it was great to see them all in good spirits. 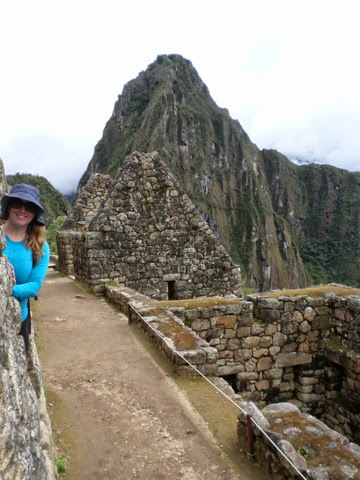 We then had a tour of Machu Picchu, which was pretty interesting. As with nearly all other Peruvian sites we have visited it has largely been reconstructed and to be honest this makes me feel a bit sceptical about everything. I was glad that I visited the museum in Cuzco town when I returned as it showed that most of the framework was there already and therefore it was less made up by the reconstructions than I had thought when we were up there. 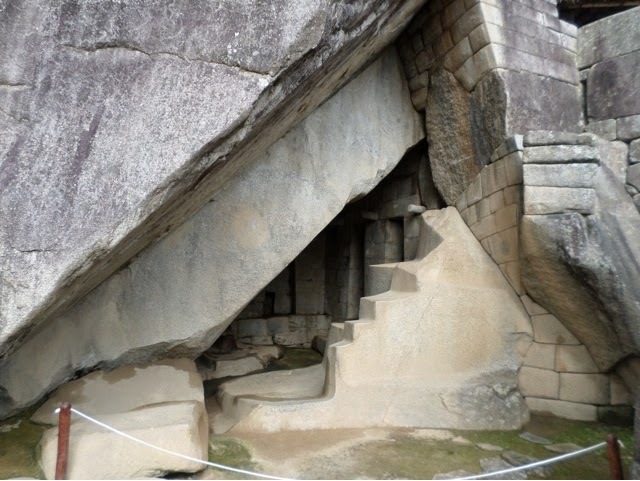 The Machu Picchu site is located on one of three hill tops and translates to mean ‘old mountain’ the other two are called ‘Wayna Picchu’ young mountain and the third one is called the baby mountain.The site is surrounded by cliffs on three sides and on the fourth side there is a wide set of steps. I don’t know if there is anything defensive about this, though it would seem to make sense. The mountains are made up of white granite which is thought to be 250 million years old. 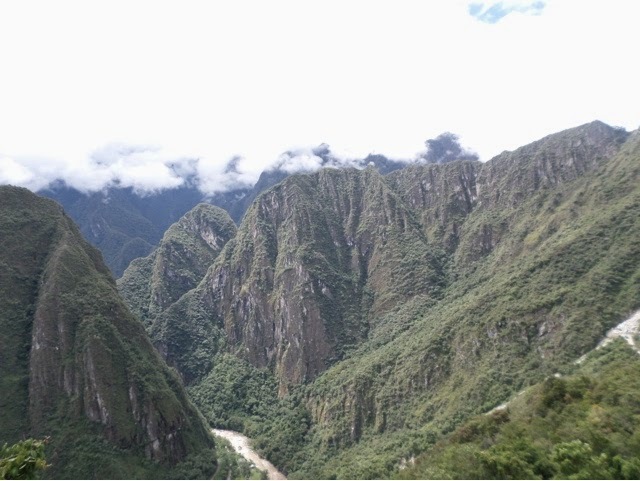 Machu Picchu was built as a royal retreat, for the royal family usually resident in Cuzco. They think it was built around 1440, one of the structures of Pacha Quetek. The site has a separate royal residence in the middle zone, this is the only area of the site which has a private bath. Around this section are numerous small enclosed residences which would have belonged to the nobility. There are also numerous cottages next to the upper terraces which are thought to have been the residences of artisans, particularly metalworkers, as evidence of metal fragments have been found in their bases and foundations. The hillsides are all terraced and it was interesting to learn that they are all constructed so that they have proper foundations. The soil profile was then constructed using layers of coarse then fine gravel and sand to ensure proper drainage. The chemistry of the topsoil has also been analysed and they found that the topsoil was actually imported from the sacred valley. Pollen samples recovered show that the crops grown in the terraces included beans and potatoes, but was mainly maize. In fact using analysis of the bones of skeletons found in tombs on the hillsides scientists think that 65% of resident’s diets consisted of maize. This is possible as potatoes and maize photosynthesise using different pathways and therefore produce different isotopic products, which can be picked up in human bone proteins. Although the site was discovered in 1911 and then largely cleared in 1912, it’s only been popular with tourists in the last 30 years. The site was declared as a UNESCO heritage site in 1983 and it’s since then that it’s been restored/reconstructed. You could see workers on the site cleaning brickwork with toothbrushes! 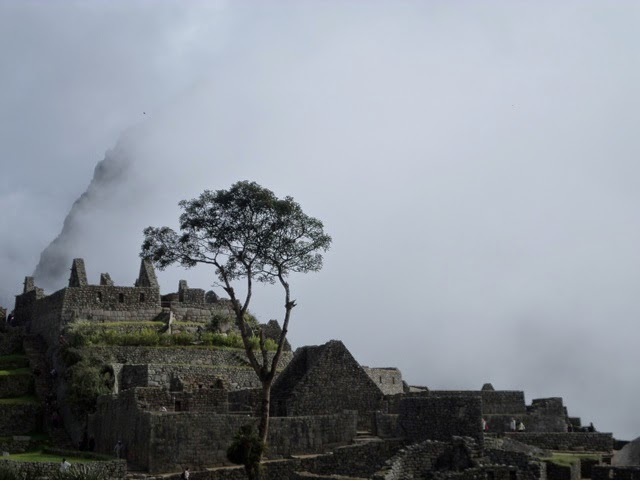 The site was ‘discovered’ by Hiram Bingham, an American, as part of the Yale and National Geographic expedition to find the lost city of the Incas. Although technically the site had been found back in 1874 by a German cartographer who was surveying the region for the Peruvian government. Hiram was lead to the site by local farmers and he actually found families living and working on the site. He returned in 1912 with a multidisciplinary crew which actually included a geologist! However, I found it interesting that their archaeological engineer had no prior experience. A lot of the work was done poorly even by the standards of the time, including not recording important information such as how artefacts were laid out. Nearly all artefacts were removed from the site and were taken abroad. It has only been in the last few years that Peru has managed to recover many of these lost items and many still sit in private collections or museums abroad. We wandered around the site and saw the large neat terraces, the metalworkers cottages and then walked up to the temple. Here the main wall was slipped as the slope surface moved, but the altar is still intact. 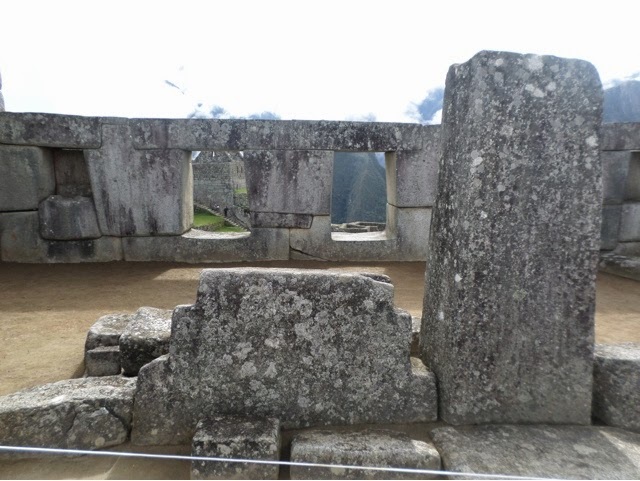 The main wall also has four windows, which apparently represents the four windows which the four first men and women came from in traditional indigenous creation stories. We also visited a small room which has interesting acoustics, you can speak into one of the many small alcoves and it reverberates round the room. Unfortunately there were Mosquitos and I got bitten again! I am like smack for mozzies! We also did some funny posing, but beware anyone who wants to do a jumping photo! The guards were actively radioing and chasing people down. One couple were made to hand over their cameras and had their photos deleted! 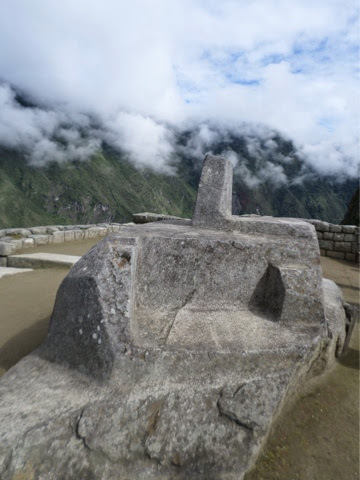 We walked up the temple, which looks the most like a recognisable Incan structure out of everything I have seen. 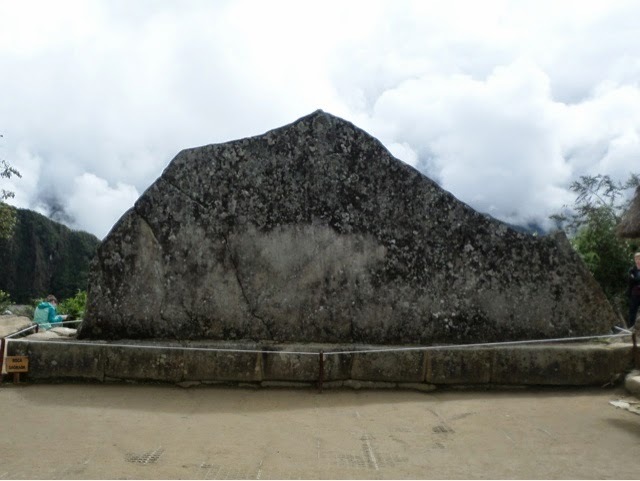 At the top is a large carved rock which they don’t exactly know the purpose of. It may have been an altar, but it is more likely a structure used in astronomy. The sun temple, located downslope by the royal residence, also called the tower, was also thought to be of astronomical importance. The two windows line up with the solstice locations of the sunrise, so you can easily identify east just by looking at the windows. We chilled out on the terraces for a while everyone was pretty achy. Michelle had to wait for 40 minutes to get a clear photo too, although we had lots of fun people watching, especially of one woman doing the most hilarious posing, proper babe watch wannabe style! Brilliant! After a while we got the bus back into town and then caught the train to Ollantaytambo. From there it was another bus to Cuzco. On the journey we were treated to amazing clear views of the mountains, including Veronica and we also saw my last camp site from the train. We arrived back into Cuzco late in the evening and it was freezing cold. Courtney and I sat in bed and ate pizza and watched The bodyguard, the perfect end to the day! 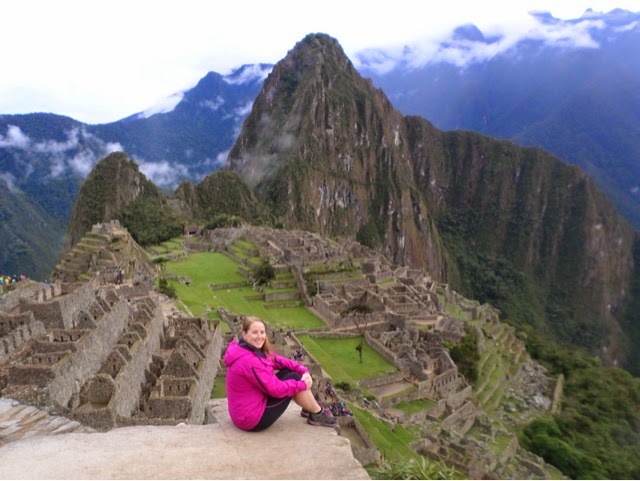 It was yet another dream come true to visit Machu Picchu and combined with the trek it has been one of my favourite things I have done in my life. Another item ticked off the bucket list! 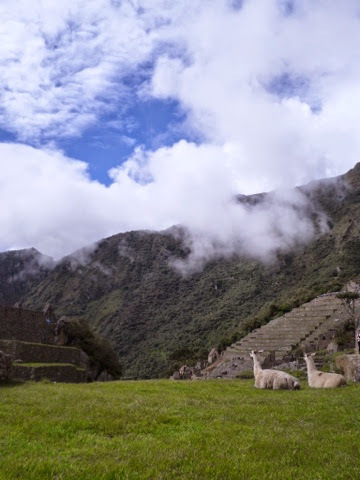 This entry was posted in Travel and tagged Hiram Bingham, Inca, Inca Trail, Intrepid, Machu Picchu, Pacha Quetek, Palace, Peru, South America, SouthAmericanAdventure, Sun Gate, Temple, Terrace, Travel, Trek, UNESCO, Wayna Picchu. Bookmark the permalink.